Today the 9th Azerbaijan International Environmental Exhibition, Caspian Ecology 2018, has started its work at Baku Expo Centre. This significant event on ecology and environmental protection, which is held annually in the Caspian and Caucasus regions, is supported by the Ministry of Ecology and Natural Resources of the Republic of Azerbaijan. The exhibition is organized by Caspian Event Organizers. Speaking at the opening ceremony, Minister of Ecology and Natural Resources of the Republic of Azerbaijan, Mukhtar Babayev, emphasized the encouraging fact that the exhibition devoted to environmental issues had become traditional and aroused the interest of international foreign companies. In Azerbaijan, much attention is paid to this area. The purpose of the exhibition is to demonstrate innovative technologies from leading foreign and domestic companies, to establish promising cooperation and exchange of experience between public and private organizations, as well as environmental education of the population. Noting the relevance of the business program, Mr. Babayev invited the attendees to take part in the anniversary Caspian Ecology 2019 exhibition next year. Director of Caspian Event Organisers, Mr Edward Strachan, noted that 43 companies from Azerbaijan, the Great Britain, Germany, Italy, Turkey and other countries are taking part in the Caspian Ecology exhibition this year. At the edn of his speech, Mr Strachan thanked the Ministry of Ecology and Natural Resources of the Republic of Azerbaijan for their support. This year’s exhibition features Azersu, BP, GIZ, Socar Polymer, Tamiz Shahar JSC and many other companies and structures. Among the debutants are Maire Tecnimont (Italy), Coca-Cola Azerbaijan, Suyum Az (Azerbaijan), Advanced Industrial Solutions (Azerbaijan), AzerGold (Azerbaijan), Haus (Turkey), Azererkov (Azerbaijan), Finnish Water Forum, Oreon Commerce (Azerbaijan) and Planettek (Turkey). For the first time, the administration of the Icherisheher State Historical-Architectural Reserve is participating with a separate stand at the exhibition. In general, Caspian Ecology 2018 demonstrates developments in the field of efficient use of natural resources, a system for collecting and disposal of solid wastes, attracting people's attention to environmental problems and their solutions. The participating companies will present equipment for disposal and recycling of wastes, alongside water purification systems, paper and cardboard production, oil and gas exploration and processing services, centrifugal technologies and much more. 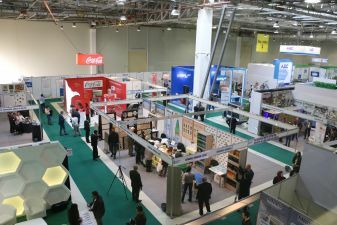 Thus, the International Caspian Ecology Exhibition will again contribute to the expansion of business contacts, exchange of experience, acquaintance with new equipment and industry trends; it will give additional impetus to the work carried out in the direction of improving and protecting the environment.